Who needs a March Madness bracket? The real fun is on eight wheels! Our monthly Skate It Out is this Saturday and you’re invited. February’s Member of the Month is a wall unto herself–a powerful blocker able to stop a jammer without giving an inch, or blast an opposing blocker out of the way, all with a smile on her face. She’s also serving on our 2019 Board of Directors as our Event Coordinator. Say hello to Pummel Entendre! January’s Member of the Month: AldanaMite! January’s Member of the Month is our tiny but mighty Argentinian powerhouse: AldanaMite! Mite is a key member of Suburban Brawl, blocking people twice her size and occasionally jamming. She’s also Brawl’s co-MVP for 2018 and was the MVP for 2017. Is a three-peat in the cards for 2019? Learn more about her below! January 26: Skate It Out! Make a resolution to join SRD for 2019’s first Skate It Out! All experience levels welcome! Come along with us on a magical journey through Suburbia’s 11th year! December 16: Skate It Out! Don’t let 2018 end without one last Skate It Out! All levels of experience are welcome! December’s Member of the Month: Queen Elizadeath II! December’s Member of the Month is derby royalty: Queen Elizadeath II! Death is one of our chief jammers for Suburban Brawl, earning MVP Jammer twice in this season alone. She’s also our current head of PR and our Vice President-Elect. Hail to the Queen! November 18: Skate It Out! Gobble gobble! It’s time for Skate It Out! Get the jump on those Thanksgiving calories by dropping in on our monthly session. All levels of experience are welcome! November’s Member of the Month: Moonie Sweets! Have you met Moonie Sweets yet? This is her first full year on Suburban Brawl and she’s certainly made an impact as one of our top jammers. She brings a positive attitude and a great big smile to every practice and bout. Learn more about her below! 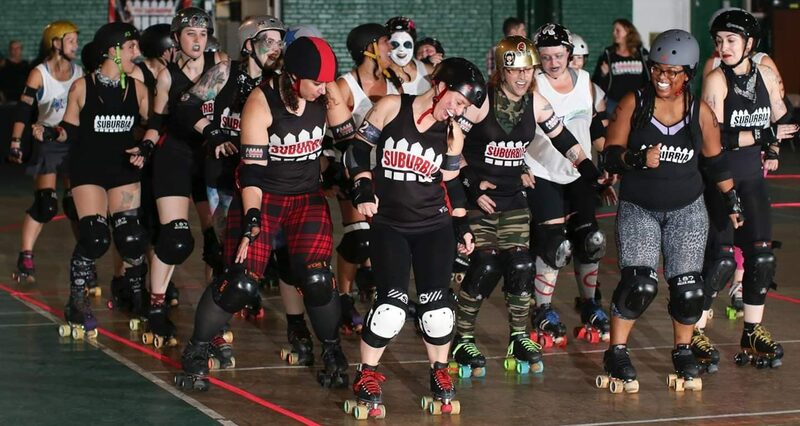 Suburbia Roller Derby, Westchester’s only flat-track women’s roller derby league, will be holding tryouts on October 22 and 24 from 7:30 to 10 pm. NO EXPERIENCE REQUIRED and nothing to lose!